How do you avoid the holiday creep? No, not your Aunt Betty’s new boyfriend; the pound of flesh that gets added between Thanksgiving and New Years. 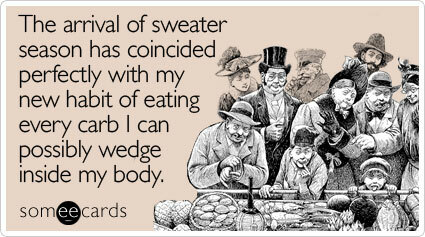 According to the Caloric Control Council the average person consumes 4,500 calories on Thanksgiving Day alone. Yikes! And beyond calories is just the general stress of the day. What’s a fit-mom-wannabe to do? Preemptive cardio. On Thursday you will be surrounded by all sorts of deliciousness, so before you go to dinner, kick up your cardio to burn some calories ahead of time. Treadmill sprints are in order. Try sprinting for 20 seconds and rest for 40 seconds for a duration of 20 minutes. Avoid crazy people. Admit it. Sometimes gatherings with the relatives can drive you nuts, especially in the era of modern families with new spouses, hurt feelings from past holidays, and shuffling your kids to three different locations on the same day. When you’re stressed your cortisol levels increase, making your body hold onto fat longer. So if someone gets on your nerves, try skipping their party. If you must attend, try keeping conversation on neutral ground and avoid hot topics that will make you argue. Make kids have a quiet time. It’s likely that the little people will be supercharged on sugar and really “fun” ideas that their older cousins come up with. When you see your kids are on the verge of a meltdown and/or trying to climb on the roof to see if that Superman cape really works, call for a quiet time out. Have them play video games in another room, or read a book, or set up a Christmas movie and let them chill out. You all will enjoy the calm. If they can nap, you score bonus points. Set a donation date. Any leftovers remaining after Sunday can be boxed up and donated to your local fire department, or brought to your office, or given to a neighbor who hates to cook. The point is get the desserts, buttery mashed potatoes, and gravy out of your house. Be grateful that you have scrumptious food, and good company to share it. Enjoy your cheat and then get back into your routine; the sooner the better. How about you? How do you keep on track over the holidays? Avoid crazy people? I guess I have to stay home this Thanksgiving!